Developer Quote: "In Fishing Joy, you’ll be able to have a deep-ocean experience catching magnificent species of fish and creatures the eco-friendly way! 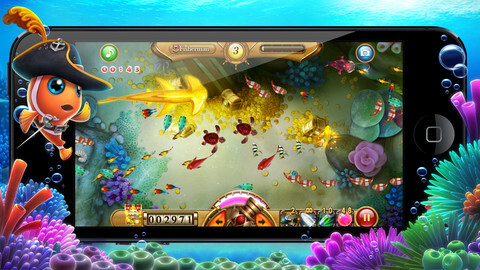 The game features stunning deep-sea graphics, music, sound fx’s for a more enjoyable and pleasant experience." (8) Tour the world’s ocean corners and experience the exquisite 3D experience of being submerged under water. (9) Game version available in English, Spanish, Simplified Chinese, Traditional Chinese, Japanese. Fishing should be a delightful and relaxing sport, and in Fishing Joy it truly is. You accumulate coins the more fish you can contain, and are given a magical powerup which has a special laser gun to help you do so. This can deter and eliminate all obstacles in its path. Get rid of the dreaded shark with just one laser flare. Select one of several cannons and fish nets which provides more flexibility in snaring the biggest catch in the sea. Plus you get to enjoy Game Center Support when playing. One of the nicest features though is the brilliant color of the 15 types of sea animals. COOL CONCLUSION: Fishing Joy is easy and uncomplicated gameplay. 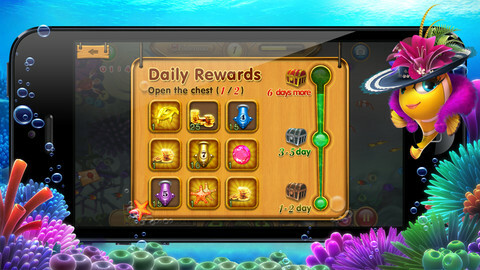 Soothing, gurgling water and beautiful graphics allow you to participate in the joys of the deep without any effort at all!